Discussion in 'UFC Discussion' started by shonuf, May 31, 2014. Jason posted on his Instagram that he has broken his left hand in the first round. 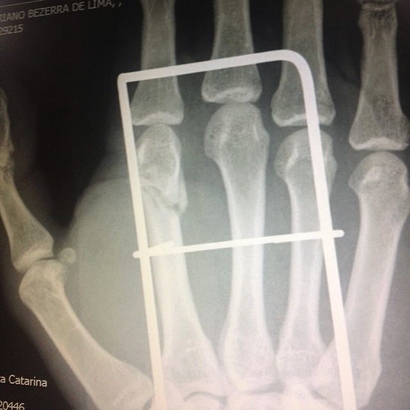 "Open fracture at two minutes of the first round. Surgery, rehab and around three months to return," he wrote. He should get a bonus and assurance that Brazil judges were playing in the mud as kids...lol He won a close fight and was bringing the fight...Even Robbie was surprised he won. He was robbed at home and that ain't cool! The JBG wasn't happy about the night and took the injury out on Rony's other arm. because mocking a brazilian is always fun. Yeah. It was pretty split on from what i've seen. The discussion forum had people picking both guys. It was a good fight. Too bad about his hand. Didn't he break his hand in his previous loss, when he punched a wall after getting KTFO in front of his family, friends and entire country?